I am now enjoying my recovery week of Guinness beef, veggie sausages (need the protein, Coach says) and lots of leg elevation and I’m finding it a little difficult to bring myself back to just two days ago to my very last 100km ride before the first Act One this Sunday. But I’ll give it a go. John and I went to Provence for the weekend to get a couple of good rides on new roads in and for our last day we chose what looked like a great loop, starting in Bédoin, climbing up through the Gorges de la Nesque, a cheeky Sault-side climb up Ventoux, then a descent down to Malaucène and finally a hilly ride back to our start, around the west side of the mountain. It turned out to be all we hoped for, I’m happy to report. 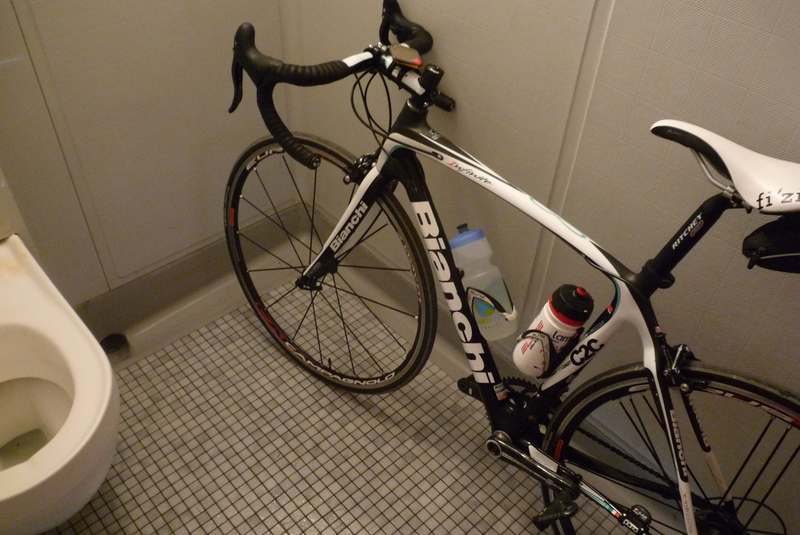 Here’s where it started, in the most bike-friendly public toilet I’ve ever seen! The Gorges de la Nesque climb starts life just a few kilometers out of Bédoin, so parking here makes good sense, if you want a warm up (not to mention the use of the above facilities..). It’s a long, easy climb that you can really get some speed up on. I don’t think you ever get over 5% or 6% the whole way up, but after you’re done you have climbed 500 meters or so. It’s a pretty and dramatic ride, as well. When the gorge stops, the lavender begins because you immediately start a gentle descent into the wide, beautiful valley below Sault, which I didn’t take a photo of. Sorry. With Ventoux taunting us from across the valley, we had a quick cup of coffee, before deciding that we needed to get it over with (a storm was coming). So we made the now-routine climb up Ol’ Baldy. Here is the beginning of that storm. 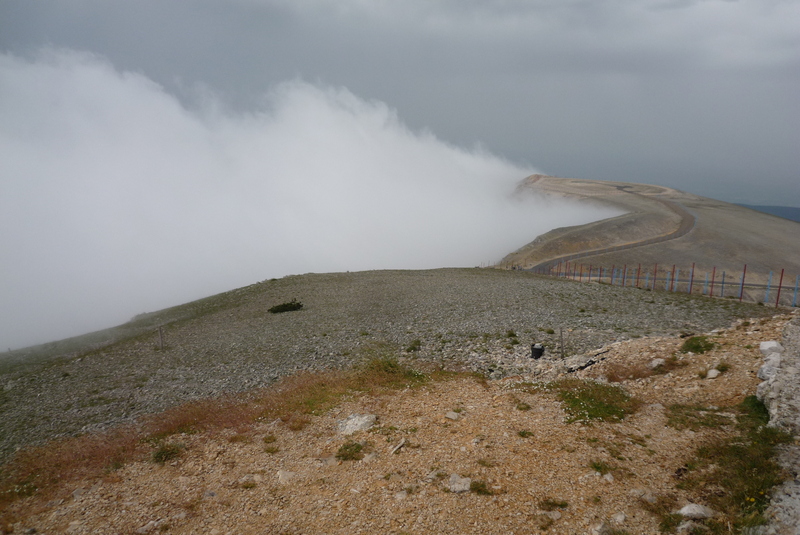 A dramatic photo of the clouds being whipped around the summit. And what our descent looked like for the first few kilometers. It was a windy and wet affair and John’s knuckles weren’t nearly welded to his handlebars by the time he reached Malaucène (I found the fun side in it somehow). But all was forgotten after lunch arrived and we got ‘the good carbs’ (in the glasses, not on the plates) into us for the last push back to the car. And what a push! 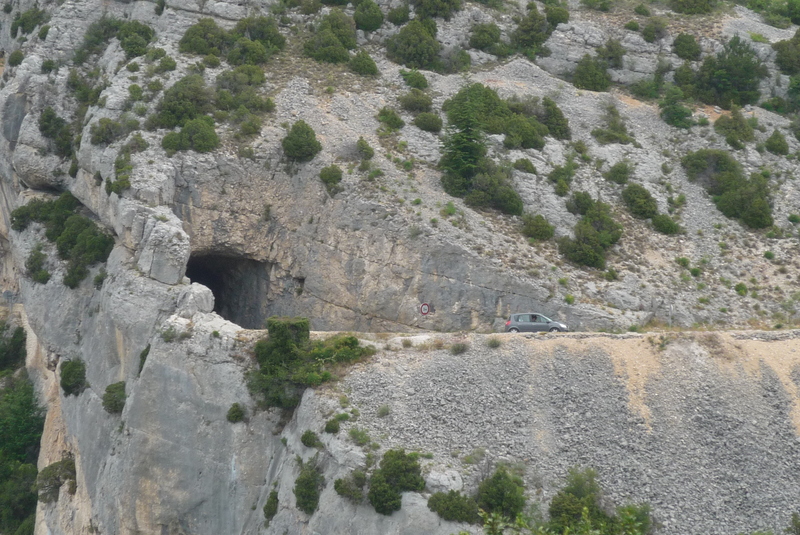 We’d both driven this little road between Malaucène and Bédoin, but had never ridden it. What a glorious little 9km it is. 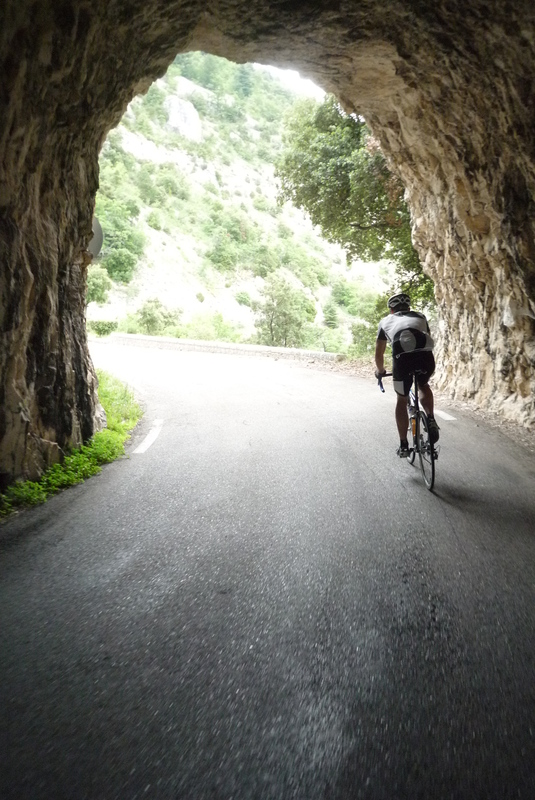 Just a little bit of climbing and some fun descents, all along a hedge-lined road that was as smooth as a pool table. It was so impressive I even whipped out a long-forgotten Canadianism and gleefully said to John, ‘Beauty, eh!’. Couldn’t have asked for a better way to finish our long training season, I think. In fact, I’m so happy with this route I’m going old-school (for very long-time readers of this blog you’ll remember this) and including a Google Map. Do this ride and thank me later. 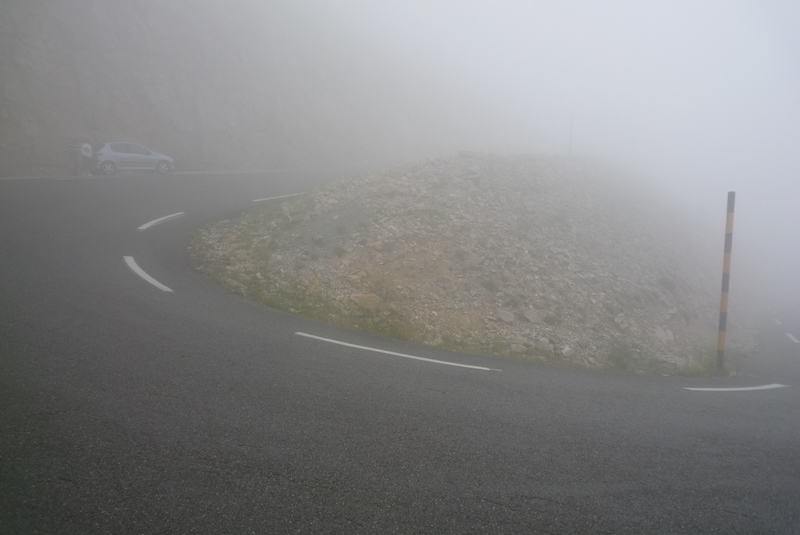 This entry was posted in Cycling, Mythic Rides / Climbs and tagged bedoin, climbing ventoux from sault, gorges de la nesque, malaucene, Sault. Bookmark the permalink. Looks like a beautiful ride, I’ll remember it. Makes me want to make two trips this summer. Now there’s an idea. 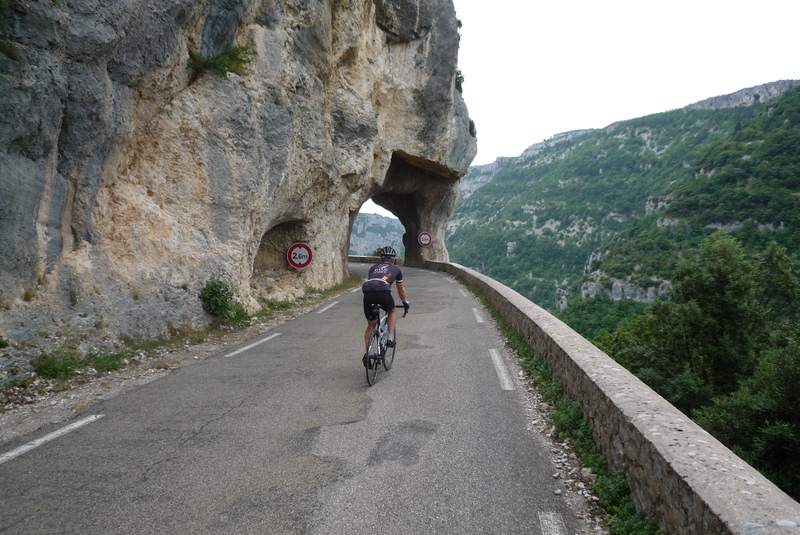 Best of rides to you on Etape 1! Now why didn’t I chose Sagan? Must have been a mental lapse there. That kid is fun to watch! 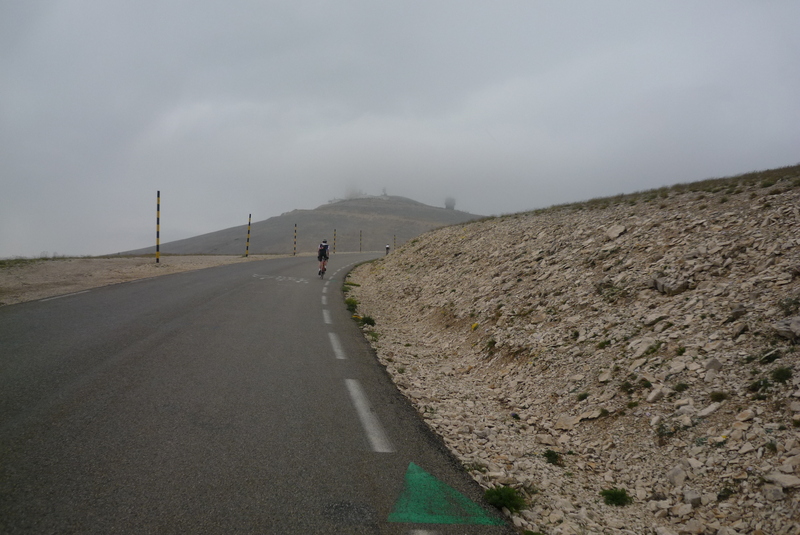 Ventoux will be there for you next year. Bald and bald! Love these roads. Had a great time touring them with my daughter Nicole last year. Great memories. Next time you’re here we’ll do The Perfect Hundred. yep, that’s the road Ann and I were on, starting from Villes-sur-Auzon…I think Ann’s knuckles are still white from grasping the car door. I bet we DID drive right past you!!!! I was glad that the on-coming storm seemed to keep away most riders (and cars for that matter) because driving that road can be a bit “exciting”. Beautiful on a bike, I am sure! I think only 5 cars passed us the whole way up that climb. It was pretty early (9am), so I think you got there a bit later. Nice, empty road! Next time you go up, stop and look for thyme and rosemary. It’s growing all along that road. Thyme and Rosemary everywhere! We stopped for a photo opportunity and commented on it. Reminds me of the night I spent sleeping on a bed of thyme by the Castellas in St Victor la Coste. Heavenly! I love the phrase “now-routine” when applied to Baldy! I have come to have some routine rides also, but nothing dramatic as yours. The carbs were temptation personified, especially the flat round one. Keep it up! Routine, but never boring! Yes, there are some good carbs to be had down here, as long as the kind in the mug is from Belgium! 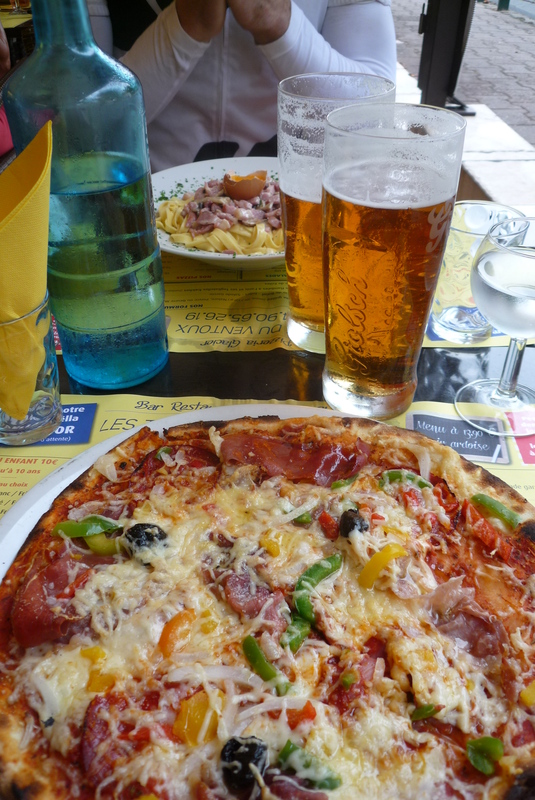 I am unacquainted with Belgium carbs as lately I have been pushing the H2O in this heat. Best of luck on the Etape. I look forward to reading about your progression through the pelaton. What amazing scenery to cycle through. And I don’t suppose you have that pizza recipe, do you? It’s beautiful and never gets old (the scenery, but I could also be talking about the pizza! ).